Hot, spicy and full of flavor, Sopa de Couve is a dish a great fall soup. Friends introduced me to this soup, it was one of their favorites and quickly became one of mine. When the nights get longer and the temperature drops, this heartwarming soup makes you feel warm all over. It’s now a fall tradition in our household. We use traditional Portuguese Chorizo sausage and homegrown collard greens (couve). In lieu of making the sausage yourself, you might be lucky enough to find a local Portuguese butcher that make their own. Also, if you cannot find the Pimenta (Portuguese red pepper sauce) at your grocery store, then we recommend trying to make it on your own. We’ll be including an authentic recipe soon! Portuguese Chorizo Sausage (hot, medium or mild), cut into slices. 1. In a large dutch oven or soup pot, sauté the diced Chorizo sausage in 2 tablespoons of olive oil. 2. Mean while, in a separate pot, parboil the cubed potatoes (with skins) on . 4. Add the peppers, sauté a few minutes and then add the carrots and celery. Cover and let simmer for a 10 minutes or so. 6. Add 1 cup of dry red wine and the pimenta, let come to a boil. 7. 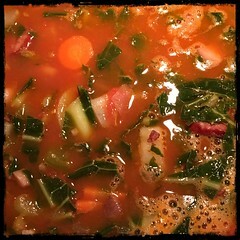 Add the can of tomatoes (roughly cut) and when it begins to boil add the bay leaves. 8. As soup comes to a boil once again, add the can of beans and let cook for 10-15 minutes. 9. Begin adding water, 1 cup at a time (4-8 cups), wait until soup begins to boil before adding more water. You should use some of the water that was used to boil the potatoes! 10. Add salt and pepper and always taste, making sure you’re not putting too much in. 11. Add the couve (collard greens). Keep tasting to make sure theirs enough salt and pepper. 12. While allowing the soup boil, add the parboiled potatoes and cook the elbow pasta (al dente). 13. Once the pasta is done, serve with the soup.